Kiefer Ravena's hilarious way of evading a foul from Jollo Go spurned social media overnight. MANILA--Ateneo got a well-deserved revenge on its archrival La Salle on Sunday night at the Big Dome, putting the latter at the brink of elimination. Thanks to Von Pessumal and Aaron Black, the Blue Eagles came back from a ten-point deficit in the first quarter to come up with their fifth straight win. 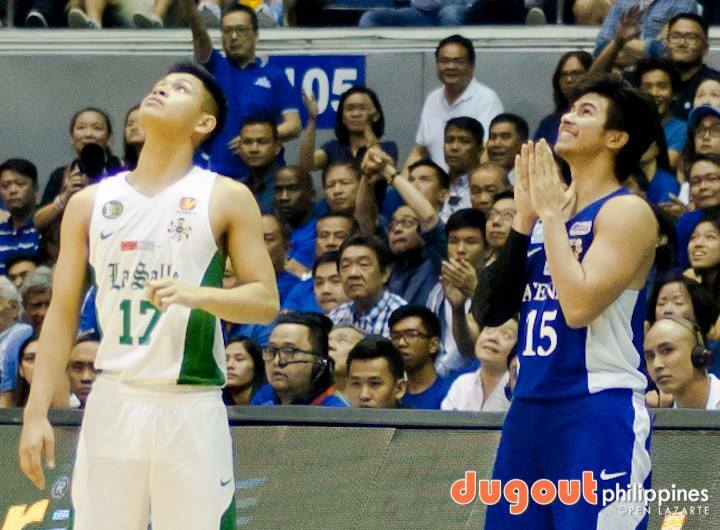 In spite of all the heat and the high running of emotions in the game, Kiefer Ravena provided a comedic spark to it enough for the social media sphere to be floored by epic proportions. With 25 ticks on the clock, with the Katipunan lads with the ball and a 66-62 lead, Ravena made an inbound pass to Adrian Wong, who had to tap the ball at Andrei Caracut's back to preserve the possession. What made it more funny, though, was the Phenom's run to avoid being fouled by Jollo Go. Social media people laughed out loud on that action, and it resulted to various memes for all of us to laugh about. Later in the game, Go eventually fouled Ravena, and the latter sank two free throws that helped keep the game out of La Salle's reach. Ravena finished the game with a relatively-steady 7-of-10 clip from the charity stripe, making up for a dismal field goal shooting.